A fly is a covering that conceals the mechanism that allows a garment to open, such as buttons or a zip. Look down and you’ll most likely find a fly on your trousers that conceals the zip or buttons. Flies are also common on overcoats and can be found on such as the Chesterfield, Crombie coat, covert coat or Balmacaan. And sometimes a fly is present on the front of a shirt. A fly-front shirt means that the buttons down the front are covered by a fold of cloth under the front. The typical fly front has the fly created by folding under the front and then folding another two layers of cloth underneath for the buttonholes. 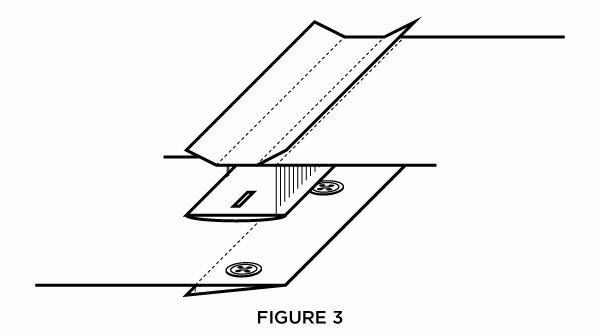 A stitching line down the front holds the doubled fly and folded buttonhole layer in place, as seen in Figure 1. Though a fly front that hides the buttons is elegant, the stitching line on this basic type of fly front is not. It’s serviceable on the front of trousers or on an overcoat where the stitching blends in with the heavier cloth, but on a shirt the stitching is more noticeable. And such a front is not symmetrical. This method of constructing a fly front on a shirt is best used for casual shirts, but it may also work on a heavy marcella front because the texture somewhat masks the stitching. James Bond does not wear this style of fly front. 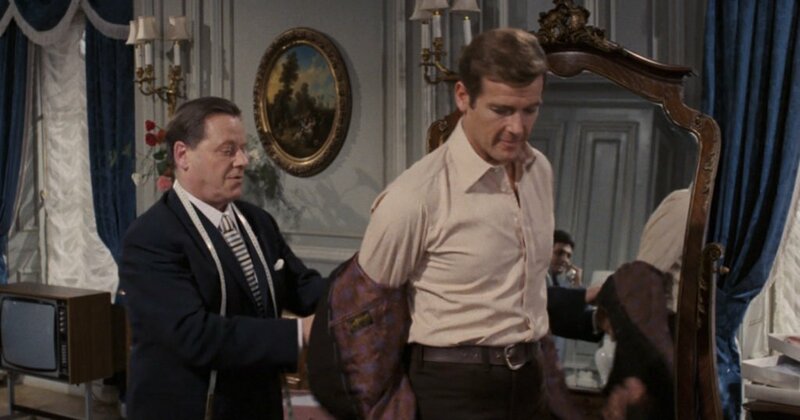 James Bond’s fly-front shirts always have a raised decorative placket that gives the shirt a symmetrical front and hides the line that holds the front together. This style can be called a hidden-button placket, a covered placket or concealed placket. 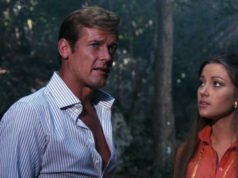 James Bond first wears this style of fly front on his Frank Foster shirts in Live and Let Die, and he wears these shirts with his suits and sports coat. Moore always hides this decorative placket under a tie when fully dressed. Frank Foster’s decorative placket in Live and Let Die has one line of stitching down the middle, which allows it to flare out. The decorative placket is folded over the top of the front like any ordinary placket, though it is stitched in an unusual way. A separate piece of fabric to serve as the functioning placket with buttonholes is disconnected from the front of the shirt is doubled and stitched together. A hidden line of stitching under the fold of the decorative placket attaches the hidden buttonhole placket to the front of the shirt. On the open side of the placket, the buttonhole placket is tacked on to the decorative placket between the buttonholes to keep the front straight and from bulging open. This style is demonstrated in Figure 2. 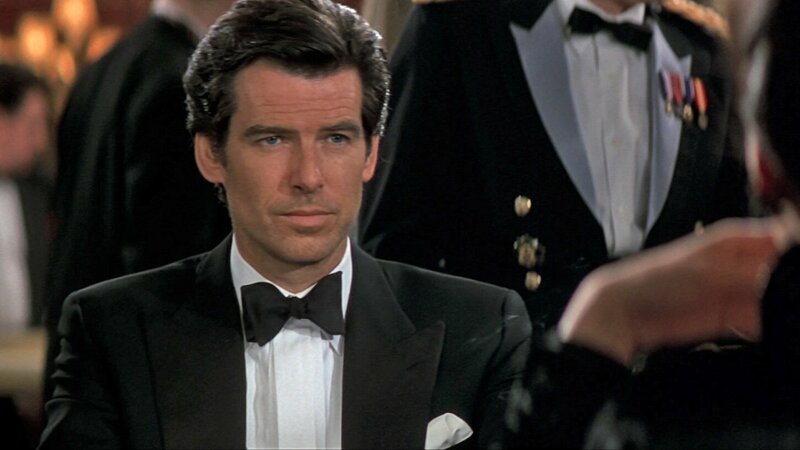 Pierce Brosnan’s pleated dress shirt in Die Another Day has a fly front stitched in the same manner. Because the shirt has texture, the stitching is difficult to see. The decorative placket serves as means of masking the stitching that holds the buttonhole placket in place. This style of fly front is usually done with a more decoratively stitched English-style placket and not with a more basic placket stitched 1/4-inch from the edge. Though any kind of shirt can be made with a fly front, it is most commonly found on dress shirts (a.k.a. Tuxedo shirts) for black tie. Though it is not improper for buttons to show on the front of a shirt for black tie, studs are a traditional dressier alternative to buttons to show something less mechanical on the shirt’s front. Since the 1960s, the fly front has been another alternative to showing buttons on the front of a dress shirt and can be a part of the traditional pleated or marcella shirts. 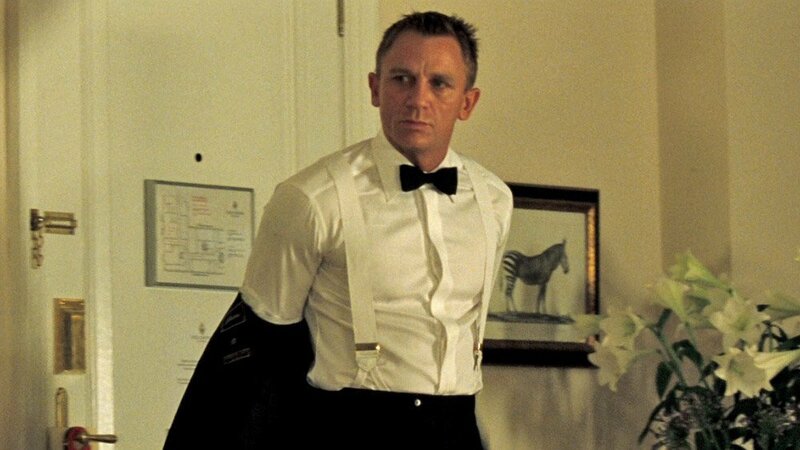 Or, as Daniel Craig demonstrates in Casino Royale (pictured top), a basic shirt made in a fancy white-on-white fabric can be made into something more special for black tie with a fly front. Such a shirt needs a soft turndown collar (spread or point) and double or cocktail cuffs. The fly-front shirt for black tie saw the most popularity in the 1980s, but it is still an elegant alternative to the more traditional button or stud plackets. James Bond has worn three fly-front shirts for black tie. Two are pleated shirts: one from Sulka in GoldenEye and one from Turnbull & Asser in Die Another Day. Bond’s most recent fly-front shirt is a plain white waffle-weave shirt from Turnbull & Asser in Casino Royale with a fly front. 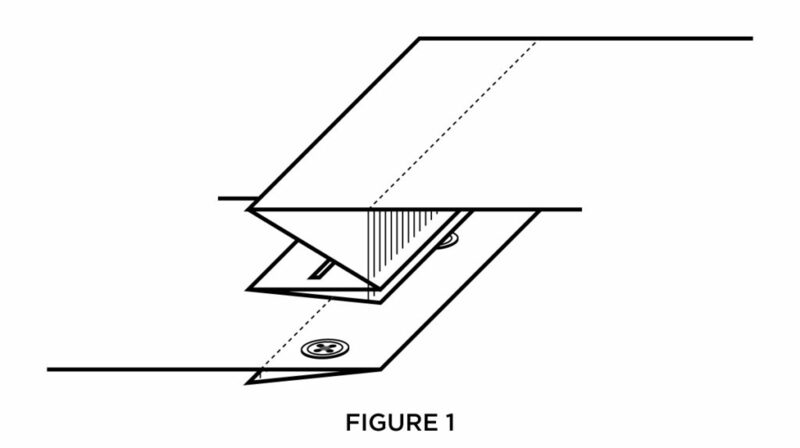 The shirts in GoldenEye and Casino Royale have decorative plackets stitched 3/8-inch from each edge, but the front is otherwise constructed the same as on the Frank Foster shirt in Figure 2, with stitching under the fold of the decorative placket to hold a separate buttonhole placket in place. This is demonstrated in Figure 3. Buttons on a fly front shirt need to be thin so they don’t cause a bulge to show through the front of the shirt. The buttons that English shirtmakers typically use should be flat enough, but the fancy thick Italian buttons will not do. 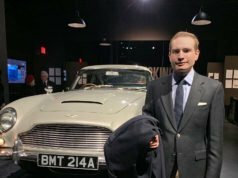 I always loved the clean look Bond’s shirt have (nice placket and no breast pocket). Clean lines are something that I admired in Connery’s 60’s suits and seeing that extended into Bond’s shirts is something that truly makes it unique. I was pleasantly surprised to see a large number of fly-front shirts at the Academy Awards last night. It’s my preferred style of evening shirt, as I like the clean, minimalist look, and I’m not a fan of putting in studs. That is good to know, I only wish more dinner suits were up to snuff. Andrew Garfield was one of the few with a well-made slim fit dinner suit which didn’t show a triangle of shirt below the button, but the trousers were hemmed a little too short, beyond the “no break” point. Often about Bond and more often about the 60s style is talk about “clean look”. You can write something about the concept of “clean look” (for suits,shirts,ties and shoes) and in what a “clean look” differs by others classic styles? Sure, I can do something on that. I would also appreciate that – thanks in advance! I’m constantly amazed at where you get inspiration for new posts, Matt! This is an interesting one. I have one shirt from Foster with this front; an evening shirt in white lightweight poplin with a cocktail cuff. He suggested this to me and it seemed like an interesting idea. As it’s a plain front otherwise, it could be worn as a regular shirt like Roger’s in LALD though I never have done so. Long may your inspiration continue, Matt! I wish I had my white-on-white stripe shirt from Foster done with a fly, but with such beautiful buttons it’s still appropriate for black tie. Matt, since Foster’s shirts get continuously praise on this blog – could you perhaps write an article about your own FF shirts? I would be very much interesting in how they have turned out!